Degree completion for adult learners is at the heart of what distinguishes Thomas Edison State University from other regionally accredited colleges and universities in the United States. Our entire academic program is focused on helping our students finish their degrees without sacrificing their personal and professional responsibilities. Since it was established in 1972, Thomas Edison State University has been dedicated exclusively to the unique needs of adults who want to finish a college degree they started earlier in life or earn a master’s degree with the same flexible methods available to our undergraduate students. 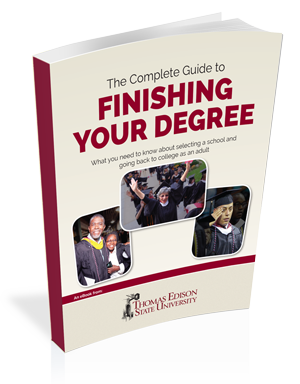 How can you finish your degree? The baccalaureate degree program in nursing and the master's degree program in nursing at Thomas Edison State University are accredited by the Commission on Collegiate Nursing Education, 655 K Street, NW, Suite 750, Washington, DC 20001, 202-887-6791. A 2009 meta-analysis by the U.S. Department of Education found that, on average, students in online learning conditions performed better than those receiving face-to-face instruction. Learn more about this study. According to the Association of American Colleges and Universities, employers believe institutions of higher learning should place more emphasis on learning outcomes, such as written and oral communication; critical thinking and analytic reasoning; the application of knowledge and skills in real-world settings; complex problem solving; ethical decision making, and teamwork skills. These outcomes are aligned with the outcomes of many academic programs at Thomas Edison State University.